This exhibition brings together three artists whose nuanced and abiding interests in weaving, fiber, and textile arts evoke the multilinear progression of both thought and material that Albers describes. Melding traditional processes with experimental techniques, Jeffrey Grauel, Melissa Leandro, and Noël Morical create works that are not defined by clear beginnings or ends, but are instead filled with layered compositions that activate color, form, and surface—built thread by thread, knot by knot. “How can [one] know how this thing is done that has never been done before?” Albers asks in a gentle nudge to be adventurous, surprised, and sometimes mystified. These artists push their materials, gestures, and processes into conceptually rich realms and experimental pathways, trusting that one thread of a thought or process may lead in a new direction altogether. Grauel’s shagged rugs, their imagery sourced from decades-old latch hook kits, reveal multiple layers of fibers—rugs buried in rugs—like scents embedded in an old carpet over time. Here, craft kits from the past are adapted into works that are both richly tactile and sculptural, the original imagery obscured and altered into a strangely unfamiliar form. 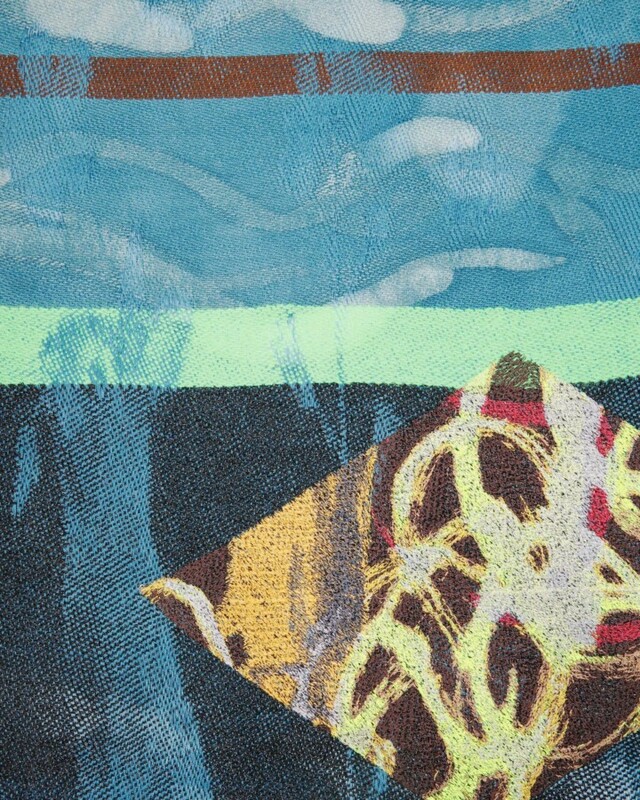 Layered processes likewise comprise Leandro’s vivid textiles which blend weaving, embroidery, adornments, domestic references, and synthetic elements. Each piece pulses with color and shifting shapes and lines, displaying a degree of chaos, as tensions between family history, tradition, and the formation of identity are combined through varied processes and materials. Weaving together the past and present, Morical utilizes the centuries-old technique of macramé to craft colorful hanging sculptures and wall-pieces that exist somewhere between domestic objects, like plant holders or garments, and alien life-forms. Held together through the tension of each tightly worked knot, the pieces seem to generate their own energy—as though filled with the potential to swell and burst apart at any moment. Jeffrey Grauel is a Chicago-based sculptor influenced by 1970’s hobby crafts. Antiquated images persist. Ideas rendered useless by time remain as flawed foundations. In my work they become advertisements burned in plywood, beer can venetian blinds, rugs buried in rugs. Well-crafted things that are useful outside of an art context, but exceptionally more complex within. His work has been presented in parking lots, former mortuaries, museums, corporate lobbies, malls, abandoned lots, faculty offices, and the windows of Tiffany’s. As co-director at Slow (an artist run gallery and curatorial project) he directs an in/dependent gallery in the bathroom (Loo), brew curated beers, give tours of artwork under hotel beds, and once carried an exhibition in a purse (Clutch Gallery) to the White House in Washington D.C. Grauel received his MFA from the School of the Art Institute of Chicago, IL; and BA from California State University, San Bernardino, CA. Melissa Leandro (Miami, FL) is an artist who works between the media of drawing, painting, and textiles. She received her BFA and MFA from the School of the Art Institute of Chicago (SAIC). Leandro’s woven and embroidered surfaces explore her composite cultural identity through means of intuitive mark-making. Reflecting on her past and present travels, she considers the impact of these environments on the fragmentation of identity and place. Leandro was awarded the Toby Devan Lewis Fellowship and EAGER Grant (Shapiro Center), both for her studio work at SAIC. Leandro has attended ACRE Residency (Wisconsin), Roger Brown House Residency (Michigan), TextielLab (The Netherlands), and is a BOLT resident at Chicago Artists Coalition. She has exhibited throughout the US at the Chicago Cultural Center; Efrain Lopez Gallery; Andrew Rafacz Gallery; Arts Incubator; University of Chicago; The Franklin; Gallery 400; Union League Club Chicago; Wright Museum of Art, Beloit, WI; N A W A, New York, NY; ArtSeen Gallery & Flagler Art Space, Miami FL; and internationally at the Central Museum of Textiles, Łódź, Poland. Noël Morical (American, b. 1989) lives and works in Chicago, IL. She received her B.F.A. from The School of the Art Institute of Chicago in 2011. Recent solo exhibitions include Skiptracing at Ace Hotel Chicago, High Swoon at Andrew Rafacz Gallery in Chicago and at the Fiberspace Gallery in Stockholm. Group and two-person exhibitions include SLOW Gallery, Chicago; Weinberg-Newton Gallery, Chicago; 99¢ Plus Gallery, Brooklyn; Athen B. Gallery, Oakland; Chicago Artist Coalition, Chicago; LVL3, Chicago.